A charming bed and breakfast in ontario stratford, Hathaway’s Cottage Bed and Breakfast is located within a 10 minute walk to the Avon Theatre, shops and restaurants and 9 blocks from the Festival Theatre. Our charming 1894 Ontario Cottage offers accommodations in stratford in a loft room with 2 twin or 1 king size bed, walk-in closet with mini-fridge, 4 piece ensuite, satellite TV and central air. Enjoy your mornings with our delicious continental breakfast consisting of fresh home baked goods. Full breakfast served on weekends. Ample parking, smoke free with no pets. Relax in our backyard gardens. Located close to all theatres, a five minute walk to downtown for antique shops and fine dining restaurants. Enjoy browsing through our local art gallery, Perth Museum, casual and relaxing walks along the avon river, horseback riding, or hiking trails. To view more information and see photos of our bed and breakfast, please click on the "enter" button above. 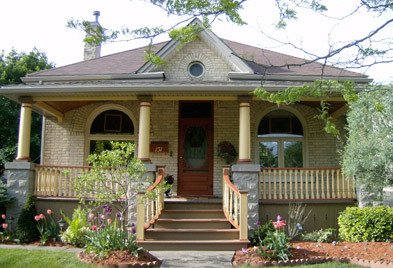 Our site provides information on our bed and breakfast in ontario stratford, our loft room, and contact information. If you are thinking of staying in stratford for a play or even on business and you need accomodations, our bed and breakfast is quiet and relaxing. We are located very close to the Stratford train station in case you are arriving from here by train. Our home is furnished with antiques and collectibles and we serve a full breakfast on weekends. Yoy may enjoy reading a book in our sitting room, or our landscaped gardens. We welcome you to contact us by phone or email and reserve your overnight accommodation at our bed breakfast in ontario stratford. We look forward to meeting you at Hathaways Cottage. Kevin and Rachelle. All Rights Reserved. Copyright. 2003. Hathaways Cottage Bed and Breakfast - Stratford Accommodations com.